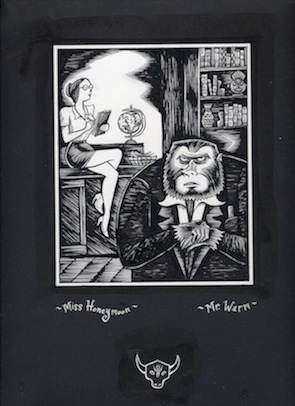 Chuckling Whatsit - Portrait - Mr Warm and Miss H.
Original portrait drawing from the "Rogues' Gallery" section of THE CHUCKLING WHATSIT. Drawn in ink in the center of a sheet of 11" x 14" white bristol. The rest of the page was created using paste-ups: the black paper was adhesive-backed paper which was cut to fit around the drawing (instead of covering the whole page with black ink, which was the alternative in those pre-photoshop days!). The white-on-black lettering is also a paste-on. I hesitated selling most of these these portraits for years, because I was worried about the adhesive of the paste-ons aging or falling off. However, it has been over 15 years now and there are no signs of aging at all. The ink drawing has some small touches of white-out/corrections, but those haven't aged or cracked at all either.